FNF Construction, Inc., established in 1984, has maintained a strong commitment to excellence on all of our projects. The majority of our projects are in the Southwest where we provide heavy-highway construction and general engineering work, both as a general contractor, subcontractor and manufacturer/producer of aggregate and asphalt rubber binder. Our partnering management approach has earned us long-lasting relationships with both government and private industry in all types and sizes of construction projects. Quality paving with in-house quality control staff to prepare mix designs. FNF’s precision work on complex bridges, box culverts and retaining walls has enabled FNF to excel in a complete range of structural concrete work. High production, outstanding quality, with portability and the latest state-of-the-art equipment and technology. Use of controlled explosives to break rock for excavation. Cost and time saving alternative to full pavement replacement. Ability to pave any event with stringent quality requirements. FNF has worked on most of the airports throughout the state of Arizona and many others all over the Southwestern United States. FNF has established long-lasting relationships with sand and gravel, metal, and nonmetal mining customers in all types and sizes of construction projects in mines throughout the Southwest. Highly portable and specialized production system to deliver material uniformly, economically, and environmentally safe at production rates that are unmatched by our competitors. country with offices in Arizona, California, New Mexico, and Texas. 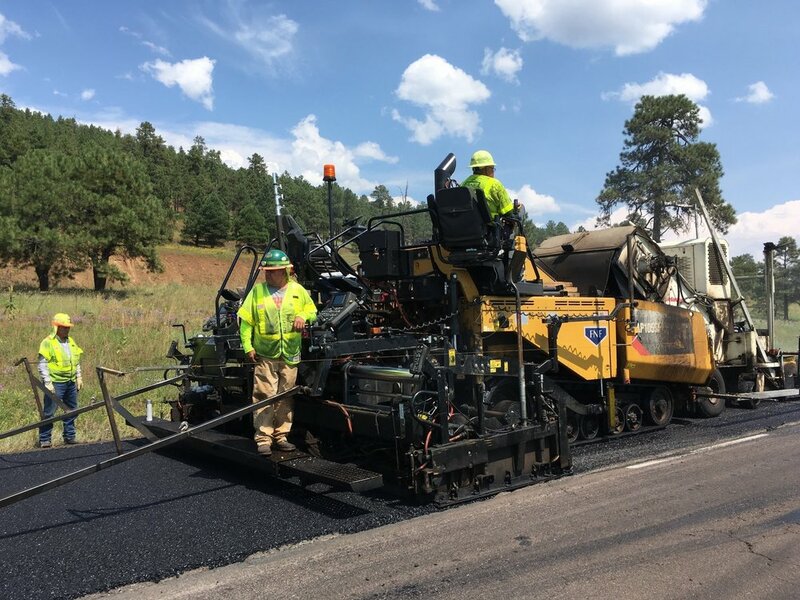 FNF removed and replaced 5" of AC in the mainline along with bridge and guardrail work on this stretch of pavement in Northern Arizona that encounters extreme winter weather. Read more about FNF's paving services. Construction of a new 5-span steel girder bridge, roadway reconstruction with signalization and lighting on the heavily traveled US 550 Corridor. Read more about FNF's structure work. FNF provides high production, high quality, and portable construction materials with the latest state-of-the-art equipment technology. Pedestrian bridge over Grand canal and flood control channel, and an arch pedestrian tunnel under Bethany Home Road along with sidewalks throughout. Read more about FNF's structure work. FNF Construction, Inc. is headquartered in Tempe, AZ with additional office locations in New Mexico, Texas, and North Dakota.